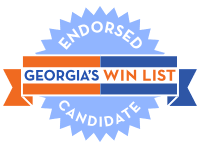 Georgia’s WIN List is proud to endorse attorney Shea Roberts for House District 52, a highly “flippable” suburban seat in Sandy Springs currently served by a Republican woman. Shea’s campaign gives citizens of the district their first opportunity to vote for a Democratic legislator in more than a decade. Shea believes her district needs a more balanced consideration of all voices and a more principled legislature to advance our community’s shared values. A Georgia native and small business owner, Shea has spent the past 20 years interpreting and applying legislation on a daily basis, and advocating for clients seeking proposed changes in land use plans, and therefore is no stranger to politics. WOMEN’S RIGHTS – Shea notes on average, Georgia women who are employed full-time lose a combined total of more than $25 billion every year due to the wage gap, a systematic inequity which affects entire families and places early onset barriers for childhood development from the beginning. She says eliminating this annual wage gap would give women more money for child care, college tuition, and living expenses. Considering Georgia leads the nation in maternal death rates, Shea will advocate for better health care for women through expansion of Medicaid as well as better education and research for women’s health issues. She is also a strong advocate for reproductive freedom as evidenced by her many endorsements from progressive groups. Shea’s candidacy has also been targeted nationally as a Spotlight Race by the DLCC. Georgia women like Shea are making history in this midterm election cycle as they run for seats long held by Republicans. With women in record numbers on the ballot this year, WIN List needs your help to elect these women and train the candidates we want to see on the ballot in 2020 and beyond.